Gilbert "Gil" Scott-Heron (April 1, 1949 – May 27, 2011) je olorin soul ati elewi jazz,, ati olukowe, to gbajumo agaga fun ise re bi onidan oro siso. ↑ "Gil Scott-Heron, Spoken-Word Musician, Dies at 62". The New York Times. May 28, 2011. https://www.nytimes.com/2011/05/28/nyregion/music-pioneer-scott-heron-dies-after-a-european-trip.html. Retrieved January 16, 2012. ↑ 2.0 2.1 Kot, Greg (May 26, 2011). "Turn It Up: Gil Scott-Heron, soul poet, dead at 62". Chicago Tribune. Retrieved June 6, 2011. ↑ 3.0 3.1 Preston, Rohan B (September 20, 1994). "Scott-heron's Jazz Poetry Rich In Soul". Chicago Tribune. Retrieved June 6, 2011. 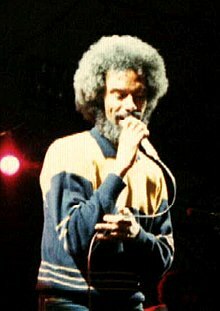 ↑ Daoud Tyler-Ameen, "Gil Scott-Heron, Poet And Musician, Has Died", NPR.org, May 27, 2011. Àtunṣe ojúewé yi gbẹ̀yìn wáyé ni ọjọ́ 14 Oṣù Kínní 2018, ni ago 20:37.